The conference room of an office is the centerpiece of the organization. It’s where deals are made, ideas are concocted and where meetings are hosted. This room should maximize function, while also epitomizing the brand of an organization. Outfitting the right conference for your business takes thought, and there are a lot of options out there. It starts with function. Businesses should consider how the room is going to be utilized to factor in the technological needs as part of the planning process. This means thinking about everything from the table, to how many individuals the room should accommodate, and what kind of hospitality services, if any, are required. The features and overall decor should also reflect the company image. 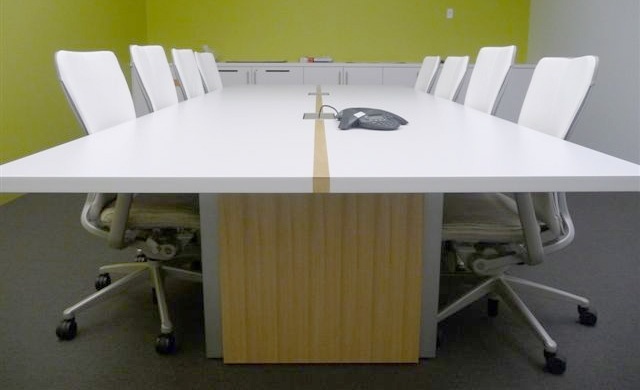 There are three main elements of a conference room, tables, credenzas and seating. 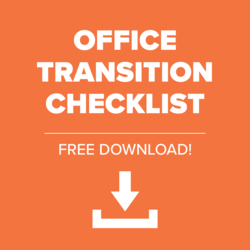 We asked Rightsize account manager, Aryn Shaw, to walk us through the process of furnishing a conference room. 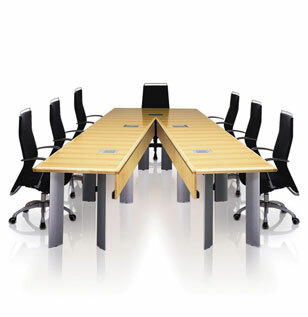 Conference tables can be powered or unpowered, depending on how they are going to be used. “Putting power in your table is a great way for employees and guests to plug right in and easily exchange information,” says Shaw. The power modules can be customized based on the user’s requirements. "Rightsize can provide electrical services, or we can work with an existing electrician to add the electrical component," she says. The table size is also important. Think about how many people should be seated at the table on a regular basis, and make sure the size can accommodate the right amount of people. This will also dictate the size of the conference room. However, if the room size is already predetermined, find a table that will comfortably fit the space. “The shape of the table impacts collaboration,” says Shaw. If there is one main focal point of the room, like a TV, a tapered table will accommodate more seating on one end over the other. When it comes to finishes, the selections are endless. The tops can be made of granite, stone, wood or laminate materials, available in a wide variety of colors. This is when the branding plays a role. If your business is more professional and traditional, consider a less contemporary finish. Bases are available in a variety of finishes as well, with big drum bases that house electrical, or they can have a leaner appearance. Most conference rooms are outfitted with a credenza below the TV. They can be simple, or they can have technology or hospitality functions built in. For example, if a business hosts regular events in the space, then they may want to consider a built-in hospitality station, with refrigerators and waste baskets. 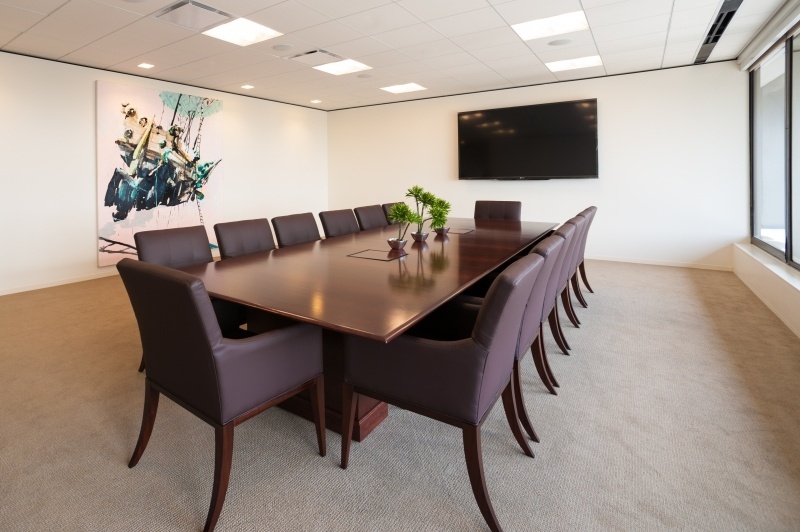 “That’s a really cool way to add additional amenities to a conference room, while keeping the look clean,” says Shaw. Like tables, credenzas are available in a variety of finishes. 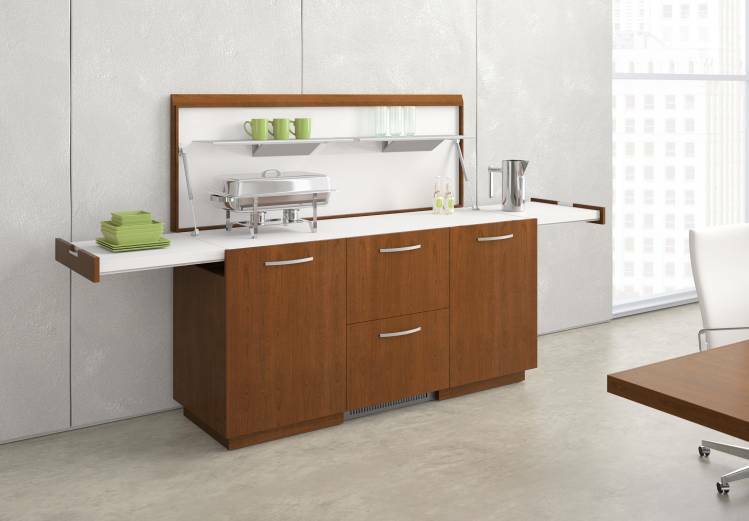 Baseline credenzas are more traditional, and then there are furniture lines that accommodate a more elaborate use. Some even have panels that extend up from the base to hold a TV, without having to mount it to the wall. “Conference seating, along with the style, is a way to show off the company’s image,” says Shaw. When shopping for seating, think about comfort and style. Adding seating that is more luxurious than the chairs located throughout the rest of the office is a worthwhile investment, as the conference room should be one of the more formal spaces within an office. Other things to consider when outfitting a conference room are sound-masking, acoustical tiles, speaker systems and presentation boards. “All of these features can be completely customized to fit the needs of the organization,” says Shaw. 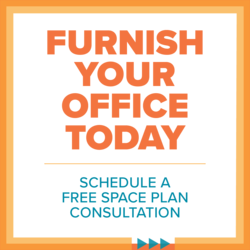 For additional information on how to furnish a conference room, contact Rightsize. We can help.